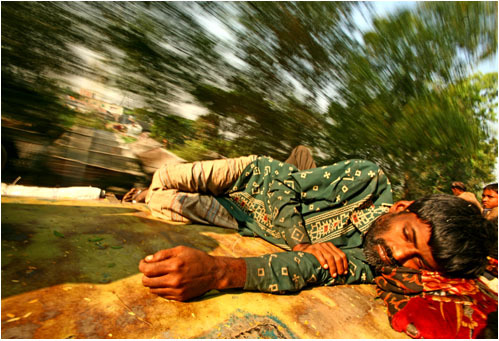 I have just come across a fascinating photo collection by G.M.B.Akash , of beautiful pictures, dealing with life in Bangladesh.In particular I have liked the train pictures .All of them are about people who travel on the train’s roof and on every conceivable space on the train including the precarious chain links between the coaches. Apart from the human interest of the picture below, what fascinates me is the counterpoising of inertness of sleep with the blurry speed of the train ,achieving a kind of death-like effect , the inevitability of the dark tunnel as though it was an intended return to the womb. The man is disintegrating in the vast space-time continuum and the walls of his consciousness have broken apart as he gets sucked into the vastness of empty space.